With amazingly bold foliage Senecio amaniensis is a hardy succulent for container or garden. 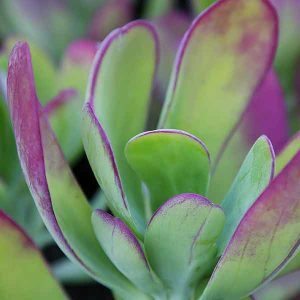 Large spoon shaped leaves, green with intense red to pink edges and flushes, the color of the foliage ismore intense in cooler climates and winter. An added attraction are the orange to red flowers that appear on a spike above the foliage in summer. Reaching around 40 cm in height, this is drought tolerant succulent once established. Easy to grow in containers where the brilliant foliage can be shown off. Also suited to mass planting as a ground cover plant in a well drained soil. Try using this foliage plant for underplanting taller growing stemmed succulents. Good drainage is essential, when growing in containers use a specialist succulent potting mix. In the garden raise the garden bed to improve drainage, or add extra drainage material if required. If prolonged wet conditions are encountered, especially during winter this cause the root system to rot. Foliage colour varies with soil and temperature. Cold winters seem to intensify the the amount of red around the edges of the leaves. For best foliage colour do not over fertilise. Height – Will reach around 35 – 50 cm in height. Soil – Well drained is essential, use a cactus and succulent potting mix for container growing. Foliage – Pale green with strong red to pink flushes. Senecio amaniensis is available for sale from most good nurseries.